It is a process that fills many in the capitalist world with dread every year. 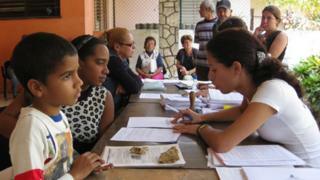 Now, for the first time, many in Communist-run Cuba are facing the same chore: filing a tax return. It is more than a year since the government increased the number of licences available for privately-run business on the island. In Havana, myriad DVD dealers and watch repairers, fritter sellers and cafes now jostle for custom on the roadside. "It'll take a bit of work for people to understand they have to pay," says Maritza Ramos, a housewife-turned-seamstress who sells her colourful creations on a street stall. "We haven't had that concept here for years, so it will take a bit of getting used to." Cuba's revolutionary leaders abolished personal income tax in the late 1960s. It was reinstated in a limited form in the 1990s when the government allowed some private businesses to operate, softening the blow as Soviet subsidies to the island disappeared along with the USSR. Now more than 358,000 people - 9% of the workforce - are registered as cuenta-propistas, or self-employed. In the leafy garden of a Havana tax office, some of them queue to consult an adviser. A noticeboard is covered with cartoons explaining the new system; posters remind first-time payers that they're making a valuable contribution to the state. State pensions do not go far, so he works in a supermarket car park. He and his wife also rent out a room to make ends meet. Mr Taquechel says the difficulty is paying the monthly fixed-rate tax for their business. Income tax is calculated on top. Recently the couple have been unable to rent out the room, as a previous lodger caused damage that they are still repairing. Even so, they are still having to pay tax, they say. The government has made some adjustments, though talk of doubling the annual threshold for income tax to 10,000 pesos (£265; $416) has not yet become reality. Currently, more than 90 activities qualify for a "simplified" tax system, a fixed monthly sum regardless of earnings. Palm-tree trimmers are the lowest contributors at 20 pesos a month. Those with higher earning potential, including restaurant-owners and cab drivers, pay sales and income tax on top. There is a sliding scale of up to 50% for earnings over 50,000 pesos a year. Squeezed by a US trade embargo for five decades, the island was battered by the 2008 financial crisis and multiple, damaging hurricanes in the same year. Cuba still has to fund its system of subsidised products and free universal education and health care. The government plans to cut tens of thousands of state jobs in the coming years to reduce costs. So Cuba's accountants are bracing themselves. Across the country, they are attending state-run courses in the new tax system. Many are becoming cuenta propistas themselves: fathoming out other people's tax returns and making payments is now a good business. The classes also teach the ethics of taxation. But that is where one student in Havana spots a hitch. His clients say high taxes risk strangling their businesses. In an economy which functions largely in cash, with few receipts, tax evasion will be hard to tackle. Still, Joaquin Infante estimates the expansion of small businesses has already netted the state 1bn pesos ($400m). It has also brought many workers at least partially out of the shadow economy. Many businesses have struggled this first year and a quarter have folded. But those who have survived say they are better off now, even with high taxes.